Do you need to buy a capstone project? As the world continues to improve in terms of technology and innovation, universities are constantly finding ways to take learning to a higher level in order to help students adapt to these changes and prepare themselves for the real world. Each university has its own method for evaluating its students, but as the student wraps up his or her academic career, there are three common ways in which they are asked to put their acquired knowledge into use: through case studies, a proposed thesis paper or by working on that aforementioned capstone project. In many ways, a capstone project can be thought of as an experimental project since students are asked to create a report that demonstrates what they have learned during the semester or even throughout their entire academic program. In the literal meaning of the word, a capstone is the final stone placed on top of a building or structure that signifies the end of the project. In the same way, professors and universities use capstone projects as the final component of the student's academic career before they graduate. It is not enough to recite what the student has learned while attending the lectures and reading the course material. They must be able to apply what they have learned in a way that demonstrates a thorough understanding of a particular topic or field of academia. In this way, they extend their knowledge about the basic concepts and show that once they begin their careers, they will be able to use it to achieve great things and even make great advances in their field. When students struggle with their academics, they buy a capstone project from EssaysLab.com. We offer professional capstone writers who come from virtually every background of academic, which means they are certain to know the ins and outs of your field of study and are versed in the proper standards of writing and research. The capstone project requires you to demonstrate proper decision-making, critical thinking skills, analyzing issues and developing a proper way to understand the processes involved in your particular topic. This is where the best capstone writing service can really make a significant impact. Understanding the use of technology as well as familiarizing yourself with the necessary methods and tools for conducting research is important if you want your capstone project to be a success. You also need to identify how global business is involving, make the right decisions after evaluating the pros and cons of every option, and recognize the importance of team management as you make policy decisions. The amount of time allocated to completing your capstone project varies between universities. For some, you might be given around 2 1/2 months. On the other hand, other universities give you a full two semesters to work on it. The first step involves identifying a problem or question and then conducing primary research in order to come up with solutions. Students are often given the option to either choose to complete explanatory research or do exploratory research. They can be research oriented or design-oriented based on their preferences. They must also decide which methodologies to use in order to collect and evaluate the data. If you are a few years into your academic career, chances are you have completed a few projects and assignments that measure your knowledge about individual courses in your field of study. For instance, if you are an MBA student who intends to work in advertising, you have likely been asked to do research on various techniques that can leader to higher effectiveness in advertising campaigns. This could involve looking at specific case studies that are related to a specific company or something more general that involves examining how certain strategies have helped a variety of companies succeed in their market. Such factors such as brand loyalty or the reputation of the company are likely to figure into the research. Lessons learned from advertising gaffs are also routinely used in order to ensure that previous mistakes are not repeated. Again, these are merely individual research projects and assignments. Regarding the capstone project, the student has to take all of the knowledge and information that they have learned during the course of their academic program and create a comprehensive report. This means stating the issue, expanding upon it, identifying problems, doing some analyzing, reaching conclusions and evaluating the skills and knowledge acquired throughout their entire academic career. You should understand that the capstone project is not the same thing as a thesis paper. Indeed, there are several differences that set them apart. For instance, the purpose of the thesis is to complete a systematic analysis about an identified problem whereas the capstone project is far more comprehensive in that it involves further evaluation. The thesis involves creating a framework for identifying the issue, determining the factors that affect it, doing some qualitative or quantitative research, developing a model, selecting the proper methods, developing a hypothesis that can be tested, using statistical and scientific tools, collecting data and analyzing it, discussing the results, reaching conclusions and making recommendations for further research. The thesis ultimately seeks out specific solutions to an important problem. Meanwhile, the capstone project takes a broader approach while highlighting important aspects of a question or problem along with potential resolutions. 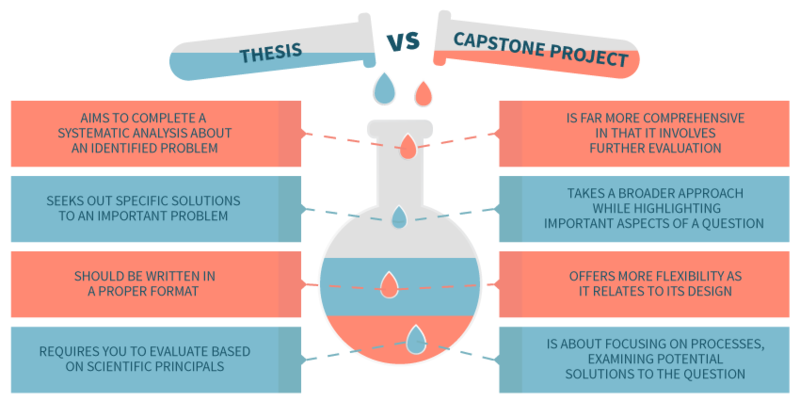 Furthermore, another major difference between the two types of assignments is that while the thesis should be written in a proper format, the capstone project offers more flexibility as it relates to its design. The thesis requires you to evaluate based on scientific principals whereas the capstone project is about focusing on processes and examining potential solutions to the problem or question. There are several goals associated with the capstone project. Its main purpose is to provide students with motivation and a sense of commitment towards their area of study. In this way, the capstone project allows students to flourish by showing off their creativity as they carry out their study. In order for this assignment to succeed, it is important that the student choose a topic or area in which they have a deep personal interest. Giving a student a stake in their own learning motivates them to do the research and obtain as much knowledge as they can. When you buy a capstone project, you are getting hands-on assistance from a true academic professional. They will help you to better understand complex concepts and refresh your skills as it relates to information you might have learned years ago. Let us face it, the capstone project offers an extremely different challenge to students as they approach the end of their academic career. There is no shame in requesting the professional capstone project services of EssaysLab.com. Even seasoned students need help with capstone project writing. When you leave the work in the hands of our expert professionals, they will enhance your knowledge about your academic area of study and prepare you to succeed once you graduate and enter the real world. There are so many reasons why you should seek guidance and allow our academic professionals to lend you a hand. For one thing, as your assigned expert works on your capstone project, they will create a framework that can really benefit you if you happen to be unfocused or indecisive in terms of your post-graduate plans. As you work with your expert, they will be able to create a capstone project that is a true reflection of your interests and long-term goals. They will show you how to set goals, solve problems, make important decisions about your career path, and generally prepare you once you receive your diploma. Every capstone project will look academic and professional and will incorporate all of the material that you read during the course of your study. This will both provide a link between what you learned during your entire time at university and be able to apply everything for future use as you pursue your professional career. A successful capstone project will help you gain confidence both personally and professionally. For one thing, the fact that you have the freedom to choose the topics, framework and direction of your project will provide motivation to succeed since it is a true reflection of your interests and goals. In addition, being given the chance to make the decisions on your capstone project means you own it, which gives you another reason to feel responsible. Just keep in mind that as you are working on the Capstone, there is no reason why you have to go it alone. Hire our professional experts to give you a major boost! The end result is a capstone project that is highly informative, practical and gets you the results that you need. Make the right decision and order your custom capstone project help with writing today! We are ready to get you started on the right track to success.